Michael said that to me a couple months ago, and I had to admit he was right. 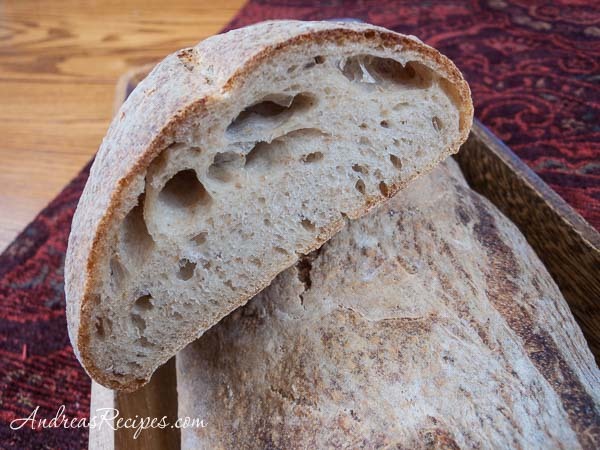 For years I’ve been drooling over photos of artisan breads, wanting to make my own, but it always seemed out of reach due to time constraints, equipment, lack of knowledge. I bought books about making bread and poured over the pages, trying to take it all in. I regularly lurk at good bread sites (Farmgirl Fare, Wild Yeast), all the while excitedly babbling to Michael about yeast, starters, shaping, and baking stones. I tried some artisan recipes infrequently with mixed success, though I kept plugging away at it. It was time to turn my bread envy into something productive. 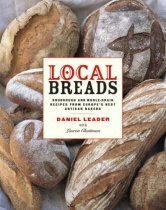 Last summer I acquired a copy of Daniel Leader’s Local Breads after reading about it at Farmgirl Fare, and I spent a couple months just reading it, enjoying Leader’s descriptions of the European breads, his “apprenticeship” in Paris and travels around Europe while he studied various techniques, and the gorgeous photos. 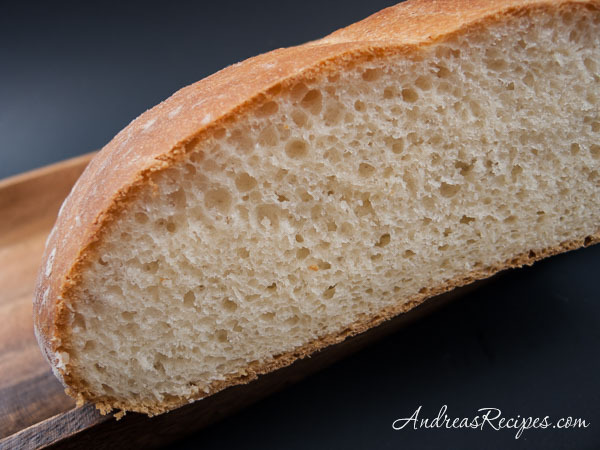 By December I knew I was ready and decided to start simply with the Parisian Daily Bread Susan had so highly recommended, which did not require a starter and could be made in about four hours. We enjoyed the bread so much that I showed my mother how to make it when we visited them over Christmas. The loaves are wonderfully crispy on the outside and chewy on the inside, and the three loaves don’t last very long at our house. After enjoying a couple batches of that yummy bread, I was ready to try my own starters, so I made both liquid and stiff dough levains following Leader’s directions. It was a little intimidating at first, and a couple times I was absolutely sure that I had killed my starters, but after nine days of constant stirring and feeding, I had two live cultures going in my refrigerator, ready for their first test. Liquid levain is a relatively new invention in the bread baking world. Pioneered by Erik Kayser in the 1990s, the levain has gained popularity because it is easy to work with and ferments faster than stiff levain. The liquid looks like a milky fluid, but it has legs and almost sheets when pouring. I keep the liquid levain on hand just so I can make the sourdough croissants in Leader’s book, which are absolutely wonderful. Flaky, flavorful, and worth every minute of effort, and we’re totally addicted. All you need is a good cup of tea or coffee to enjoy with them, no jams or marmalades required as they have so much flavor. My hips are thanking me for not trying the chocolate croissants yet! The croissants have lots of butter in them that must be folded and rolled into the dough. The soft dough is folded and rolled three times, followed by a 12 to 24 hour rise in the refrigerator, then rolled again, cut, and shaped. One of my first attempts failed because I did not distribute the butter well enough during the folding and rolling phase, so I ended up with lots of butter on one end of the dough and very little on the other. 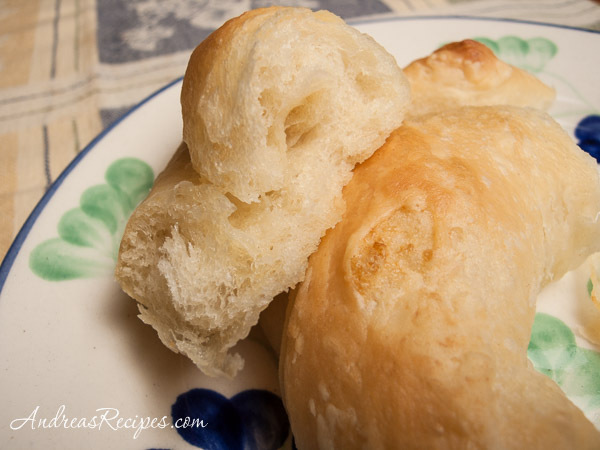 This gave me some very flaky, buttery croissants and some…crescent rolls with little butter flavor. During my most recent attempt I fell asleep while the shaped croissants were rising and they really poofed, so much that they lost semblance of a croissant, but they still tasted good. I just need to keep practicing, and what a joy that will be! The stiff levain is about as authentic as you can get. The traditional flour used to create the levain is Type 55, a French hard wheat all-purpose flour with about 11% protein content. Per Leader’s recommendations I used organic unbleached all-purpose flour as a substitute in the levain and all the breads I made with it, which worked very well. I’ve made traditional pain au levain (next photo), which has whole wheat flour as well as rye flour. It’s a good hearty bread. 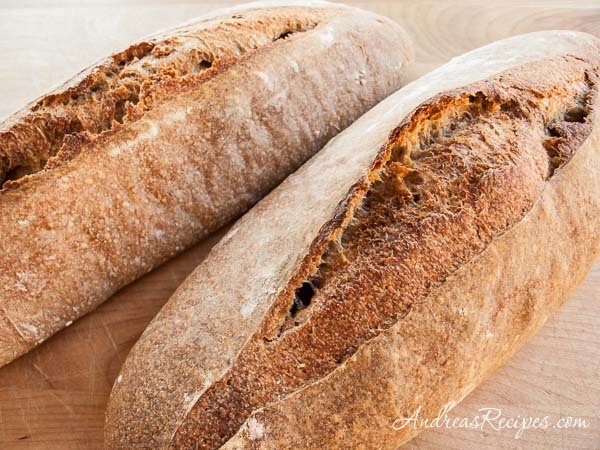 The stiff levain also forms the basis for a wonderful rustic light rye from the Auvergne (next photo), a free form bread made from a wet dough with lots of tunnels. It’s a great first bread because you don’t have to shape it any particular way, and it’s not slashed. You just stretch the risen dough and bake it. 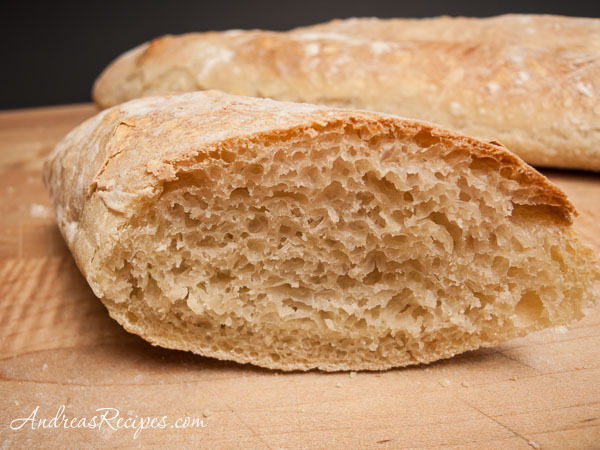 This is another hearty loaf, and we use it for dipping in French Onion Soup. Though Leader focuses on baking with levains, he does offer some breads that use pate fermente or bigas instead, pre-ferments that only requires 8 to 12 hours of time to make before mixing the dough, and a few quick breads that mix the yeast right in. 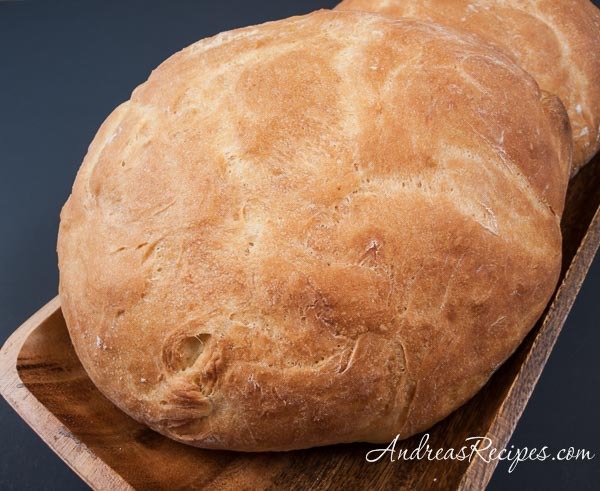 One of our favorite quick breads is this Tuscan ricotta bread, pane alla ricotta (photo at top and below, recipe below), a soft enriched bread with a mildly nutty flavor. The recipe makes two rounds, and they didn’t last very long in our house. The boys like this bread as much as the croissants. Local Breads quickly went to my top shelf and I’m working my way through the book planning to try every bread at least once. I think I have a pretty good start! Leader provides measurements for all recipes in volume, U.S. weight, metric weight, and baker’s percentages. I’ve included the volume and metric weight measurements here. He also gives directions for both hand mixing and stand mixers, but since I generally use a stand mixer I’ve included just those directions here. Adapted from Local Breads, by Daniel Leader. MIX THE DOUGH: Pour the milk and water into the bowl of the stand mixer. Add the yeast, flour, butter, ricotta, and salt. Stir just until the dough comes together. 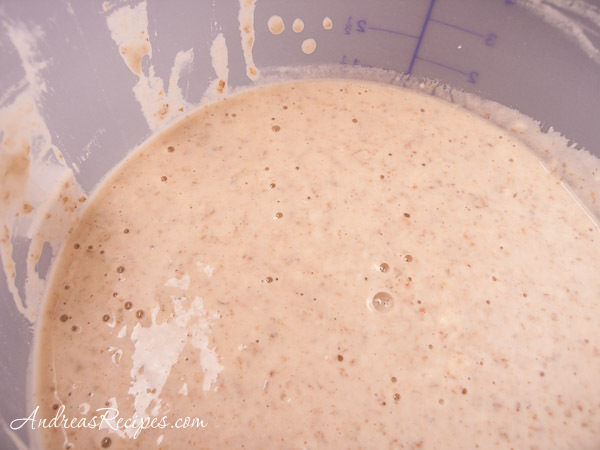 FERMENT: Transfer the kneaded dough to the prepared 2 quart container. 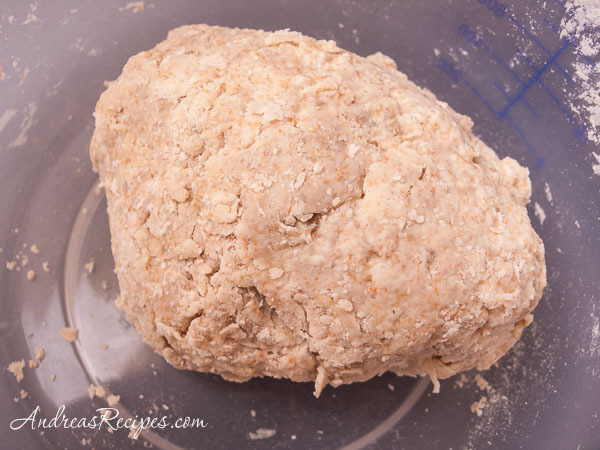 Use a piece of masking tape to mark the point at which the dough will have doubled in volume. Put the lid on top and leave to rise at room temperature (70 to 75° F) until the dough doubles and inflates into a dome, about 1 to 1-1/2 hours. It should deflate slightly when pressed. SHAPE: Turn the dough out onto a lightly floured counter. Use the bench scraper to cut the dough into two equal pieces. Roll each piece around the counter, shaping into a ball. Cup your hands around the ball and move in tight circles, until the dough surface becomes taught and smooth. Place the shaped loaves smooth side up on a sheet of parchment paper, about 4 inches apart. Cover with plastic wrap. PROOF: Allow the loaves to rise at room temperature (70 to 75° F) until the look puffy and have nearly doubled in size, about 1 to 1-1/2 hours. The dough should spring back slowly when you press a finger into it. Preheat the oven: About 1 hour before baking, put the baking stone in the middle of the oven and the cast iron skillet on the bottom rack. Heat the oven to 400° F.
Bake: Put a fresh piece of parchment on the bakers peel/rimless baking sheet and dust with flour. Gently flip the rounds onto the parchment so that the bottom side is up. Slide the parchment with the loaves onto the baking stone. Pour the ice cubes into the hot skillet and close the oven. Bake until the rounds are golden, about 20 to 30 minutes. COOL AND STORE: Slide the peel/rimless baking sheet until the parchment and remove the loaves from the oven. Slide onto a wire rack and allow to cool for a few minutes, then remove the parchment and allow the loaves to cool completely, about 1 hour. Store in a resealable plastic bag at room temperature. Will keep for 2 to 3 days, or freeze for up to 1 month. And now it is my turn to have envy, of your book and your bread. I shall have to try this when I get done with a little back log of baking I have to clear. Andrea … I’m stunned! Don’t even know where to start drooling! I love each and every one of the breads you are so casually showing here. Does this mean I need another bread baking book? I think it does! Wow! May I pay homage to you for such amazing yeast creations? I bow down before you! I think I need to go to the bookstore now! You all are so sweet! I really can’t recommend the book highly enough, it’s been so helpful for me. It is a beautiful and wondrous book. Daniel Leader has been a favorite of mine since his Bread Alone. I am so sorry. . . pfsst. . . . no I’m not. Congratulations! You’ve now got the yeasty bug and I doubt it will let you go. Your breads here are over the top beautiful! Thank goodness I already have had this book some time or I’d be racing to the book store now. I always have a tub of ricotta in my fridge. Why have I never made bread with it? Oh, thank you, Andrea! I’ll be trying this for sure. Tanna, you are right! I’ve been bitten and am now officially addicted to baking bread! Is there a 12 step program for people like us? Bread Bakers Anonymous??? Susan, we really like that ricotta bread and I hope you like it, too! Your bread looks delightful. Sounds like it would go great with a dish of pasta. Hi. My name is Andy, and I’m also a bread baking addict. I think I’ve done a good job hiding it, but I’m terrified that one of my friends will come over one day and find the packets of yeast in my fridge, or that when I’m going out I’ll miss a smudge of that telling white powder on my brow or shirtsleeve. For tips on being a more functional addict, I recommend the The Bread Baker’s Apprentice by Peter Rienhart. If we’re going to live with this monkey on our backs we can at least try to maintain our health. Peter has further tips in this regard in his latest book on whole grain breads.